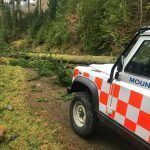 The Team were alerted by Patterdale MRT to an incident reported by a third party, where a lady appeared stuck in steep ground near the top of Nethermost Cove. Both Teams responded immediately in conditions that were cold, savagely windy, and very slippery under foot. With snow flurries blowing through, visibility was also a major problem. Keswick team swept the ridge, whilst Patterdale covered the Nethermost Pike area. After two hours, there had been no sign of the person reported to be in difficulties, and it was concluded that she must have self rescued. 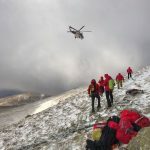 At this point, Keswick Team were called to a second serious incident on the Thirlmere side of Helvellyn, and stood down from the search.